Packs Project has introduced designer backpacks and travel bags with high quality vegan leather for those who prefer leather for durability & designer backpacks for fashionable appeal. Packs Project has just introduced the latest summer collection of backpacks and bags into the market. While buying leather backpacks, bags or travel bags, fashion crowd prefers designer backpacks over plain leather backpacks. Packs Project introduced designer backpacks and travel bags with high quality vegan leather for those who prefer leather for durability and designer backpacks for fashionable appeal. Packs Project launched Total 6 designs in its summer collection ‘Lux’. 2 backpacks are added into mason backpacks collection named ‘Mason Backpack (Lux Grey)’ and ‘Mason Backpack (Lux Tan)’. Another 2 bags are added in Kingman Weekender collection named ‘Kingman Weekender (Lux Grey)’ and ‘Kingman Weekender (Lux Tan)’ and 2 bags in mercer duffle collection namely ‘Mercer Duffle (Lux Tan)’ and ‘Mercer Duffle (Lux Grey)’. These Backpacks and travel bags are made from High quality Vegan Leather. These Backpacks have Signature "Packs" interior lining which is made up of Cotton-Poly fabric with Exposed contrast silver metal zippers. Backpacks and luggage bags are must haves for keeping your important stuff while travelling or going anywhere. Regarding unique features of Backpacks, they have custom packs silver pulls and laptop compartment for 13’’ laptop. They also have vegan leather/mesh padded shoulder straps with front storage pocket with exposed silver zippers. Dimensions of Mason Backpacks are 17” (L) x 5” (W) x 12” (H). 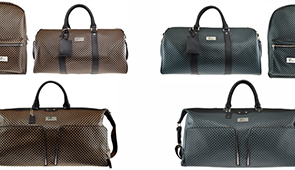 Now coming to Duffle Bags collection, it has mixed features of backpacks and weekender bags. It has Standard Cut away storage inner pocket, Vegan leather/canvas padded shoulder straps ,5 Silver metal landing docks on the bottom like weekender bags and custom packs silver pulls like backpacks But It is made with different dimensions of Dimensions: 21” (L) x 8” (W) x 14” (H). These backpacks and bags have checks print and available in 2 classy colors ‘Brown and Black Checks Print’ and ‘Grey and Black Checks Print’ which gives it a really classy, elegant and fashionable look. For more information visit our website www.packsproject.com.